The 10-page debt sustainability analysis, distributed to eurozone officials last week but obtained by the Financial Times on Monday night, found that even under the most optimistic scenario, the austerity measures being imposed on Athens risk a recession so deep that Greece will not be able to climb out of the debt hole over the course of a new three-year, €170bn bail-out. ….The report made clear why the fight over the new Greek bail-out has been so intense. A German-led group of creditor countries — including the Netherlands and Finland — has expressed extreme reluctance to go through with the deal since they received the report. It’s not clear to me why this report changed anyone’s attitude toward Greece. 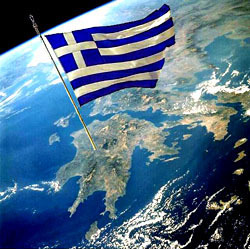 Of course the austerity measures being imposed on Greece are going to send them into an even more wrenching recession. And of course no one in their right mind is going to loan money to Greece for many, many years to come. This can’t possibly have come as a surprise to anyone, could it? A “tailored downside scenario” in the report suggests…Greece would need about €245bn in bail-out aid, far more than the €170bn under the “baseline” projections eurozone ministers were using in all-night negotiations in Brussels on Monday….Even under a more favourable scenario, Greece could need an additional €50bn by the end of the decade on top of the €136bn in new funds until 2014 being debated by finance ministers on Monday night. I’m willing to bet that even these scenarios are unduly rosy. A more realistic analysis would probably produce even grimmer news, but that’s the price of a fixed-exchange-rate area. If the eurozone’s rich countries aren’t willing to sign up for this, they probably should have just cut the cord now and thrown Greece to the wolves. UPDATE: Felix Salmon is blunter than I am: even the “tailored downside,” he says, “still looks astonishingly optimistic.” His whole piece is worth a read. It explains the deal in pretty lucid terms.